Plot: Drunk drivers are bad, but put a drunk driver in a giant robot called a Labor and you’ve got a disaster waiting to happen. 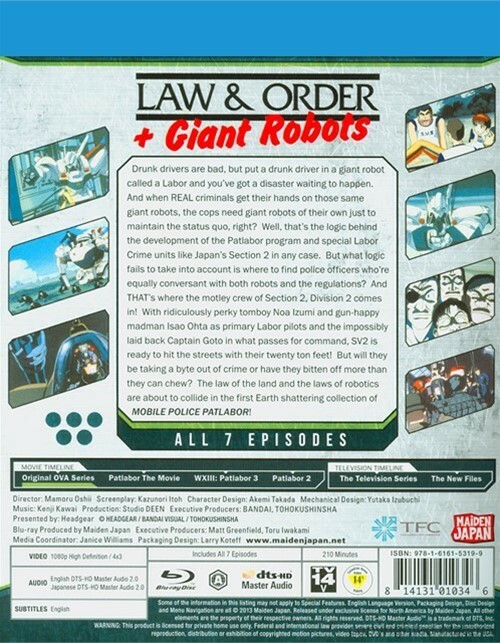 And when REAL criminals get their hands on those same giant robots, the cops need giant robots of their own just to maintain the status quo, right? Well, that’s the logic behind the development of the Patlabor program and special Labor Crime units like Japan’s Section 2 in any case. But what logic fails to take into account is where to find police officers who’re equally conversant with both robots and the regulations? And THAT’s where the motley crew of Section 2, Division 2 comes in! With ridiculously perky tomboy Noa Izumi and gun-happy madman Isao Ohta as primary Labor pilots and the impossibly laid back Captain Goto in what passes for command, SV2 is ready to hit the streets with their twenty ton feet! But will they be taking a byte out of crime or have they bitten off more than they can chew? 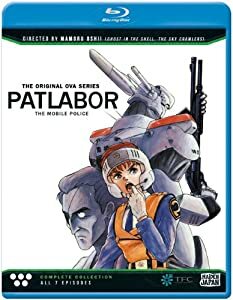 The law of the land and the laws of robotics are about to collide in the first Earth shattering collection of Mobile Police Patlabor!